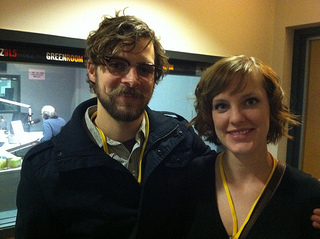 Question asker Ross Brodt and his girlfriend Danielle Seagraves. 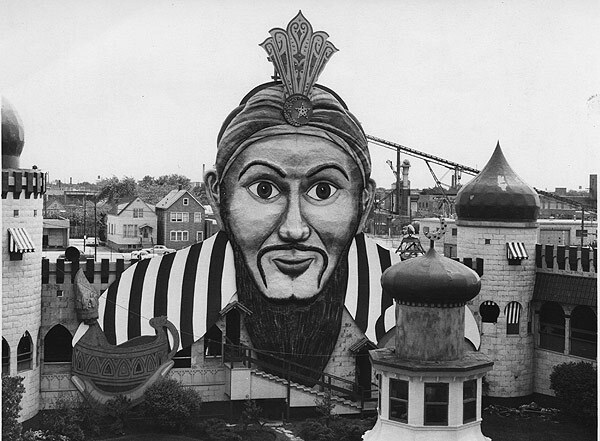 Aladdin's Castle at Riverview Amusement Park. Hot rods at Riverview, circa 1963. What are the origins of Riverview park and why was it torn down? Remnants of Riverview Amusement Park are still visible near Ross’s own neighborhood, around Belmont and Western. For one, the cement foundation of the park’s ticket booth still peeks out from the ground, though today it’s not clear visitors know the concrete’s origins. Bicyclists, for example, use the area for dirt jumps. Apparently, the land can’t help but attract thrill seekers — decades after the park closed in 1967. But it seems the memories are even more present than actual physical remnants. We got a strong response after we set up a hotline to collect memories, and we found numerous people to interview, including workers and fans of the park. Many told us they had never experienced anything like Riverview, and that it was their best childhood memory. One source, WBEZ host Richard Steele, says that when someone brings up Riverview, it literally gives him a physical sensation. The memory, he says, is that palpable. We could write all day about the funny, touching and sometimes strange stories, but really, these memories are better experienced. In our interactive map above, you can explore stories, videos and pictures about the park and how people remember it. You can hear Marshall Brodien — known for his appearance as Wizzo on the Bozo the Clown TV show — talk about work as an announcer for the Riverview’s Freakshow. Or, you can hear about an odd collection of earrings that the manager of the Bobs Roller Coaster kept. After that, take a ride on the tunnel of love, hear about the sadistic operators of the Pair-o-Chutes ride, or learn about the chilling accidental deaths that occurred on some rides. Why would such a popular park close? The nostalgia surrounding Riverview Park made the first part of the question (again, about the park’s origins) easy to answer: There was a market for amusement, and the park fit the bill. But that same nostalgia actually makes answering the second question, why the park closed, that much harder. Had the demand for fun simply dried up? There are rumors that Riverview closed because of racial tension and rising crime. To tease out this claim, we called Victoria Wolcott, who wrote about Riverview and other amusement parks in her 2012 book Race, Riots, and Roller Coasters. Wolcott said research was a struggle because people’s love for the park was intense, so much so that people sometimes resisted discussing Riverview’s darker sides, including racism. Her research relied, instead, on archival articles from black publications such as The Chicago Defender. The park was ostensibly integrated, but publications describe minorities who felt unwelcome, as they were the targets of slurs, heckling and threats. Tazama Sun, an African-American who provided us with memories of his trips to the park as a teenager, loved visiting Riverview with his friends. But Sun recalls being called the n-word, and said it was generally understood that when blacks left the park, they could not linger in the surrounding neighborhoods. African-Americans, he told us, got on the bus and went straight home. The attraction was similar to dunk tanks you can still see at carnivals. Someone sits on a bench that’s suspended above a pool of water, all while people throw balls at a target that — when hit — drops the person into the drink. What’s notable about the Riverview version, though, is that the person being dunked was always African-American. (Several people describe this attraction in the annotated map above, or you can listen below). The NAACP eventually succeeded in closing the African Dip in the late 1950’s, but the park remained a perceived flashpoint when it came to race. In 1966 Dr. Martin Luther King Jr. visited Chicago during the “fire hydrant riots.” Wolcott says Mayor Richard J. Daley marked the occasion by shutting down Riverview for days, out of fear the park would be a site of trouble. But Chuck Wlodarczyk, author of Riverview Gone But Not Forgotten, says money — not race — was responsible. The park stood on precious land, he says, and eventually was sold to a development company. William B. Schmidt (grandson of the original owner, William Schmidt) negotiated the final sale. Although the cost was not divulged, Schmidt told the Times News newspaper that its published estimate of $6.8 million was too low. Victoria Wolcott agrees that economics played the deciding role, but the closing of the park should also be understood in a larger context. As the park became more integrated, she points out, Riverview gained a reputation for being seedy and dangerous. Wlodarcyzk used to perform shows about the park and said multiple people approached him saying they had “a friend of a friend” who was raped in the bathrooms by a black man — though no actual record of that crime exists. Similarly, A Chicago Tribune article from Oct. 3, 1967, blamed violence for the park’s closure, and Schmidt said crime was one of his motivations for selling the park. “You see this thing a lot, when African Americans begin going in large numbers [to amusement parks], the parks are increasingly associated with danger and criminality,” said Wolcott. These assumptions, about safety after integration, led to a trend, seen across the country, of “white flight” at amusement parks. 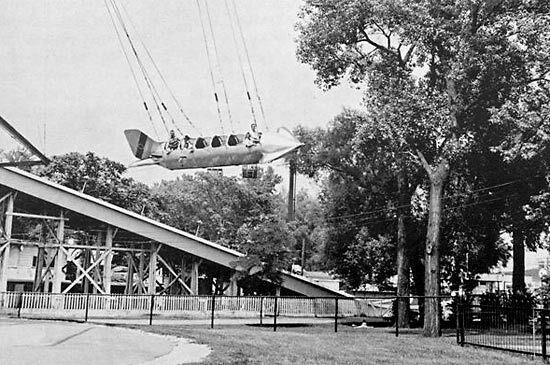 Amusement parks such as Riverview used to be in urban centers, as they were easily accessible by public transportation. But slowly, those urban parks closed or moved to the suburbs, far away from trains and buses, and new parks such as Six Flags Great America bypassed the city in the first place. Amusement parks also became more expensive. This is something that many of the people who shared their memories came back to again and again. Riverview was something special, something we don’t see today, because it was part of the city. It was right there, smack dab in the middle of everything, reflecting all the good and bad Chicago had to offer.